Athlone Institute of Technology (AIT) has been designated as a College of Sanctuary in recognition of a range of initiatives demonstrating a commitment to welcoming asylum seekers and refugees into the college community and fostering a culture of inclusion for all. 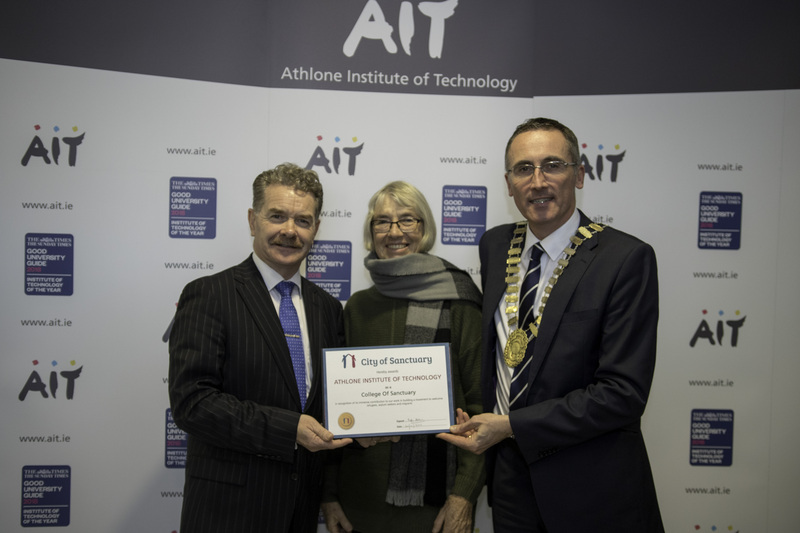 AIT is the third HEI in Ireland - following DCU and UL - to attain this accolade and is the first recipient of the College of Sanctuary which is awarded by Places of Sanctuary, an organisation that supports efforts in Ireland and the UK to build a culture of hospitality for people seeking sanctuary. The award was marked at a celebratory event held on campus which was attended by all of the of the stakeholders involved including the team from AIT Theresa Ryan and Dr Chris McDermott who lead the committee for the Integration of Asylum Seekers and Refugees, the residents of the local direct provision centre, New Horizon volunteer group and Westmeath Community Development. AIT established a Committee for the Integration of Asylum Seekers and Refugees and set out to create formal links with the New Horizon Refugee and Asylum Seeker Support Group, Westmeath Community Development, and the management company in Lissywollen. A team from AIT, led by Theresa Ryan, Access Officer, commenced humanitarian work with the Lissywollen Direct Provision Accommodation Centre on the edge of the town of Athlone, by way of contributing to social integration and academic advancement of asylum seekers and refugees in the Irish Midlands. AIT first reached out with a children’s Christmas party on campus, and 40 children and parents from the Lissywollen Centre attended. Mindful of adverse attitudes to women in some cultures, AIT established a weekly women’s group, with students and staff from AIT leading workshops in creative writing, art, knitting, flower arranging, sewing, crochet, and nail manicure and art. Among other initiatives were social outings including to a performance in the local Little Theatre and to exhibitions, and events in partnership with the local football club. New Horizon and AIT collaborated to provide a lecture series to inform and enlighten students and members of the general public about migration issues, with AIT’s Law Lecturer Dr. Chris McDermott sharing his expertise. They also ran a weekly legal information clinic on the direct provision site. Career and curriculum vitae advice was provided to Lissywollen residents by AIT staff and New Horizon volunteers, English language classes were delivered, and library membership including computer access was rolled out. An online learning programme was developed by AIT and over 40 residents availed, and AIT and New Horizon collaborated to develop a website that provides information and opportunities to residents. non-traditional-CAO-route students. Five completed the programme and attained their qualifications. One exemplary student, 31-year-old South Africa native Vuyani Samuel Booysen, was awarded a scholarship and is now on his way to earning his Civil Engineering qualification in AIT.